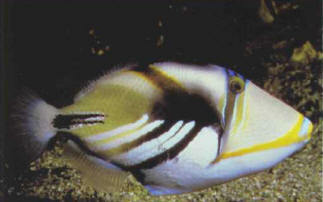 Its common name, the Picasso trigger fish, comes from its distinctive coloring. It defends its territory fiercely. Some related species (R. asasi, R. rectangulus, R. verrucosus) are sometimes commercially available, often under the same name. Size: 20 cm.